More than a third of voters were influenced by the TV debates between the political leaders in the run-up to the election, a survey has found. According to a Panelbase survey of 3,019 people, 38% were influenced by the debates, 23% by TV news coverage and 10% by party political broadcasts. The research group said TV was "by far the most influential media source", outscoring newspapers and social media. Of the papers, the Daily Mail came top followed by the Guardian and the Times. On 2 April, an average audience of seven million people watched the leaders of the seven biggest parties in England, Scotland and Wales take part in a leaders' debate on ITV. It was the only live debate that David Cameron agreed to take part in, following a fierce row which broke out between the parties over three potential debates proposed by the broadcasters. 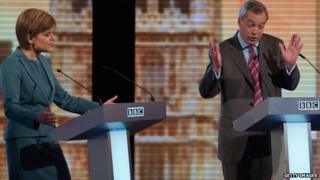 A fortnight later, more than four million people tuned in to BBC One's televised leaders debate, which featured the leaders of the five opposition parties which had participated in the ITV debate. BBC Two's Daily and Sunday Politics show, hosted by Andrew Neil and Jo Coburn, also held a number of other debates featuring leading politicians. Of those surveyed by Panelbase, 62% said TV coverage overall had been the most influential in informing them about the general election, the parties and their policies - helping them form their opinions. TV wielded far more power on those surveyed than newspapers at 25%, websites at 17%, radio at 14%, and speaking to family and friends at 14%. People were least likely to be influenced by social media and magazines, with Facebook the leading influencer for just 7%, followed by Twitter at 4% and magazines at 2%. Ivor Knox, managing director of Panelbase, told the BBC: "While social media use has expanded hugely in recent years, its influence on most people's opinions seems to have been fairly limited in the lead-up to the General Election." Mr Knox pointed to separate research which has shown that social media can often serve as an "echo chamber" for peoples' own views, since we usually surround ourselves online with people who think along similar lines. The research, published by Science magazine, examined how 10.1m US Facebook users interacted with shared news on the site. Mr Knox said that Panelbase's research showed that major media outlets also "led the online conversation". Of those who said they were most influenced by what they read on websites, 61% said they had read their political information on the BBC News website, followed by newspaper websites at 31% and Sky News at 25%. Google searches were most influential for 23% of those gathering information online, followed by the political party websites at 21%. He added: "Social media came well down the list, below radio and conversations with friends and family." Of the 740 respondents (25% of the overall survey group) who claimed to be influenced most by newspapers, 30% said the Daily Mail had been most influential in shaping their opinion. The Panelbase survey was conducted less than a week before the general election across a sample group of 1,013 adults in Scotland and 2,006 adults in England and Wales.